America's leading authority on supervision in the federal civil service has written the definitive work on managing federal employees, thoroughly covering from a supervisor's perspective every important aspect of human resources management from hiring to firing. 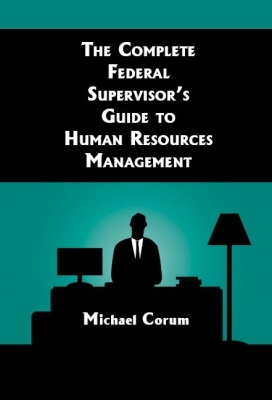 Unlike federal agency policy manuals, this book is unique, as it is not a recitation of personnel rules and regulations, but shows line federal supervisors only the most crucial rules they need, but more important, specific strategies and tactics for hiring the right people, structuring their jobs to best motivate them, managing their performance, maintaining discipline, and managing their time. This book will serve a dual purpose: First, it will be the most comprehensive work written on supervision in federal civil service. However, each chapter will also include at the end a quick reference guide that gives both a summary and a checklist to serve as a tool kit for dealing with each issue. The Nature of Federal Employees and Their Work � Why supervising federal employees is different. Hiring � Managing through each of the four basic steps of federal hiring. Job Structure � The strategy and realities of job design and assignment of duties in federal service. Managing Performance � The supervisor's role in each of the five phases of performance management. Discipline � The essentials of discipline and detailed analysis of the four decisions federal supervisors must make in a disciplinary case. Adverse Actions � The joint roles of the supervisor and the HR department, and what the supervisor needs to know about Adverse Actions. Handling Medical Problems on the Job � A detailed guide to the options and correct courses of action in dealing with every common medical problem federal supervisors encounter. Ethics � The most important ethics rules supervisors need to know for their own protection, and those needing top enforcement priority with employees. Controlling Absenteeism � The essential rules on leave and attendance, and strategies and tactics for dealing with the most common absentee issues. Labor Management Relations � The rights of all parties under a labor agreement, and the four basic areas of union involvement in HR management. Equal Employment Opportunity � The basic EEO rules and prohibitions, and the most common danger situations federal supervisors will encounter.